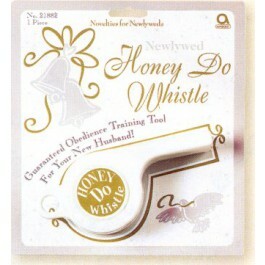 A great gag gift for the bride to be, this gigantic whistle will ensure attention. The packaging explains it's a "guaranteed obedience training tool"! Tie it on top of the gift or tuck it inside for a great conversation piece. Gift is carded on packaging that is 8.5" x 7.75".